Why do we need plant phenotyping? Plant derived products are at the center of grand challenges posed by increasing requirements for food, feed and raw materials. Integrating approaches across all scales from molecular to field applications are necessary to develop sustainable plant production with higher yield and using limited resources. While significant progress has been made in molecular and genetic approaches in recent years, the quantitative analysis of plant phenotypes - structure and function of plant - has become the major bottleneck. Plant phenotyping is an emerging science that links genomics with plant ecophysiology and agronomy. The functional plant body (PHENOTYPE) is formed during plant growth and development from the dynamic interaction between the genetic background (GENOTYPE) and the physical world in which plants develop (ENVIRONMENT). These interactions determine plant performance and productivity measured as accumulated biomass and commercial yield and resource use efficiency. The EPPN2020 is a reseach infrastructure project funded by Horizon 2020 Programme of the EU that will provide European public and private scientific sectors with access to a wide range of state-of-the-art plant phenotyping facilities, techniques and methods, and help boost the exploitation of genetic and genomic resources available for crop improvement that represents a major scientific challenge for this coming decade. 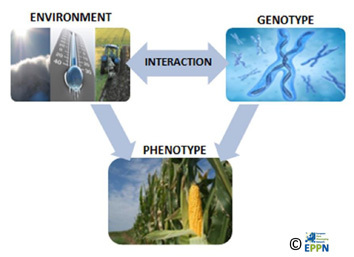 EPPN2020 specifically aims to facilitate the community progressing across the whole phenotyping pipeline, involving sensors and imaging techniques, data analysis in relation to environmental conditions, data organization and storage, data interpretation in a biological context and meta-analyses of experiments carried out on different organs at different scales of plant organization.